This impregnable fortress was named Kisimbasimba, the city of lions. No sound escaped from the place; never had the shadow of a human being been glimpsed at any point on its ramparts. It was surely devoid of inhabitants, absolutely deserted. And yet, by night, its walls lit up, and were populated by monsters and by phantoms. Before writing The Enchanted City: A Journey to Lake Tanganyika (1885), Eugene Hennebert consulted Jules Verne; the result is a novel that combines exotic adventures with scientific discovery, with a buoyant tone and an action-packed narrative. Following on the trail of past heroic expeditions, a disparate band of French explorers, embark upon the quest for Kisimbasimba, the eponymous "enchanted city" of Central Africa. During their epic journey, they will face dangerous native tribes, legions of hostile animals, trek through mysterious underground caverns before they finally reach their goal. 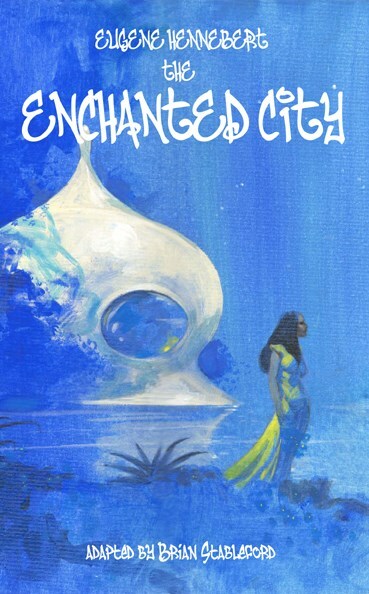 Contemporary with H. Rider Haggard's King Solomon's Mines, The Enchanted City is a somewhat didactic and earnest portrayal of the heroic age of African exploration, celebrating the achievements of an era which, today, is filled with nostalgia. Eugène Hennebert: La ville enchantée : voyage au lac Tanganika. 1893.